Shruti's Blog: Arrey Wah! Haleem! The route to school in Gunfoundry and back ran along the King Kothi Road that housed the palace of the Nizam. The walk was always interesting and eventful. Long stretches of tall walls of several palaces and mansions spiked our curiosity. What was behind those unscalable walls? The fortifications were perhaps my first cognisance that reality leaves a lot to the imagination. Occasionally, a gate would be open just enough for a glimpse of shocking pink bougainvillea on whitewashed walls arising out of well-manicured lawns. Flower beds and colourful crotons were contained by tilted terracotta bricks. Some days, a vintage car would roll out. If we saw a distinguished looking gentleman in sherwani and fez hat, we would claim that we had seen the Nizam! We could have stared forever, but would walk on, too scared of the livery to linger. The peeps were ammo enough to break the rolling monotony of motorcar spare part shops that looked like a continuum of hubcaps. It almost distracted us past the scary graveyard. The other interesting sights were the umpteen little restaurants that punctuated our path each way. The uniform glass jars with Osmania biskoots, bright coloured coconut barfi, Afghan crim rolls and the likes were tantalising enough, but what really got us from afar and stayed with us for long was the savoury scent of the crisp onion and dill samosas frying fresh. Come Ramazan, the jungle gym of bicycles in front of the Irani Cafés in Hyderabad would clear up magically during the day. Restaurant shop fronts retreated behind drawn curtains and dropped awnings. The only visible sign of activity would be the huge gleaming copper cauldrons on large iron sigris outside on the streets simmering for hours at end. Their committed bubbling would only be disturbed occasionally by men in skullcaps and checked ‘lungis’ diligently paddling around a wooden ‘ghotni’ in whatever was cooking inside. Trudging home tired and ravenous after school, how could we escape the thrall of these aromatic potion pots! As we passed, those men that looked like Mohammad Ghori or Ghazhani out of Amar Chitra Katha comic books would rake and break the scummy surface of the concoction, letting out delicious aromas that stirred up our hunger, too! Nearby, a red linoleum lined stand hosted a pyramid of inverted white china bowls, obsequiously waiting to pressed into service. We didn’t know what was cooking in those crocks. The signs on the awnings and screens were in Urdu. The picture of a headless goat standing with the steadfast resolve of Casabianca, or that magnificent looking curly horned ram so cheerfully accepting his fate told us enough to avert our eyes in horror. However, we couldn’t help but sniff out that whatever was cooking, was certainly seemed very delicious. Years later, I learnt these handis held haleem and paya and that the two were different. I must confess I was disappointed to hear the description of the dishes from Dada, who would lie in wait for Eid to visit his friends in the old city to hog haleem and paya. Our cryptic Hyderabadi exchange was hardly helpful! And of course, he was a real brat, er boy. Is the word 'brat' a contraction of 'bhratru', Sanskrit for brother ? I had to patiently tease information out of him. “Paya was a broth made of trotters or hooves of a cow, goat or lamb. 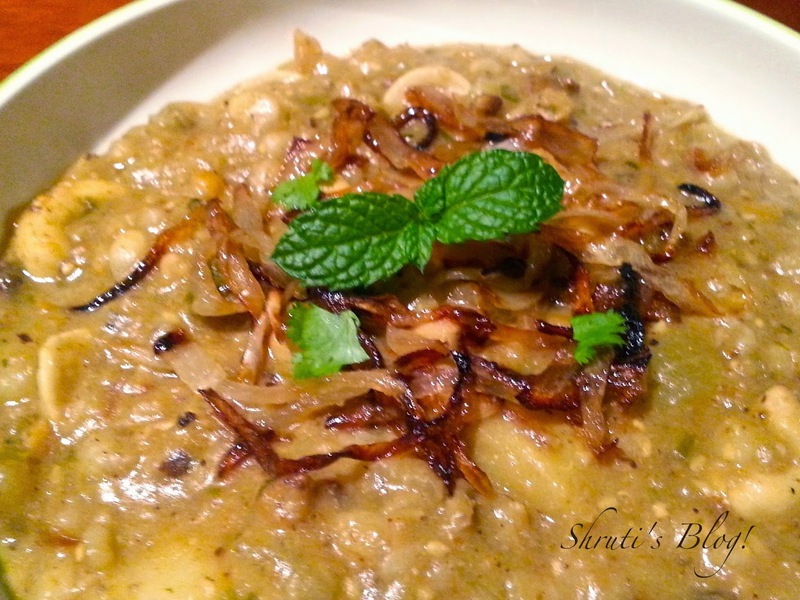 “Haleem was like a bajra khichada that Aai made or a savoury version of the “gavhachi kheer”, except it had meat in it." AKA - dhat teri ki! As if it mattered; I was never going to eat either. A chance sighting on YouTube, a fortuitously saved portion of cooked barley pearls and daliya mixture and a vague memory of some unidentified spice that had been inadvertently introduced to my spice rack several seasons ago helped me discover the joys of haleem. I stumbled upon the ‘ Vah’ Chef Sanjay Thumma making a vegetarian haleem in his inimitable style. A little clove look-alike spice that he called kabab cheeni reminded me that I had some of these at home but had never used out of a prejudice about naagkeshar that I had inherited from Aai. I had also saved a portion of cooked barley pearls and daliya from when I had made a kheer last week. A half large eggplant and a portion of lauki offered to add some body and a cup of soy milk agreed to pitch in place of the regular one that had expired. The pudina in the planter in the balcony nodded reassuringly. The result was this magic potion called haleem. It was now time to say, Arrey wah! Haleem! Heat olive oil in a pressure cooker and add kabab chini, shahi jeera, green cardamom, cinnamon sticks, pepper corns, cumin seeds and let the spices splutter. Add cashew nuts, chopped almonds, sesame seeds, green chilly and sauté for a minute and then add fried onions, ginger garlic paste and sauté for a few minutes more. Next add the lauki and eggplant and allow it to sauté further. Then add the milk, chopped coriander, chopped mint, salt to taste and mix thoroughly. Then add the daals, cooked daliya and barely and mix it well. Once the mixture comes to boil, place the lid on the cooker and pressure cook for 15 minutes (2 to 3 whistles) on a slow flame. When the pressure cooker cools enough to remove the lid, you may want to mash the mixture well and adjust the consistency by adding some more water and cooking it further without the lid. I retained some texture and bite amidst the stickiness. Add 1-2 tbsp of ghee, lemon juice as per taste and adjust the salt. Serve hot, garnished with more fried onions chopped coriander and mint leaves. 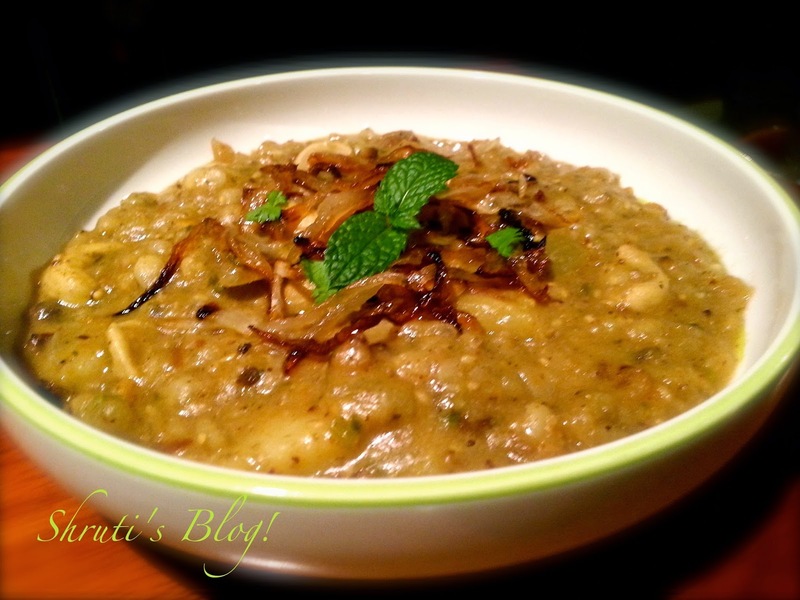 Haleem tastes even better the next day as the flavours develop and deepen. Arrey Vah Shruti. 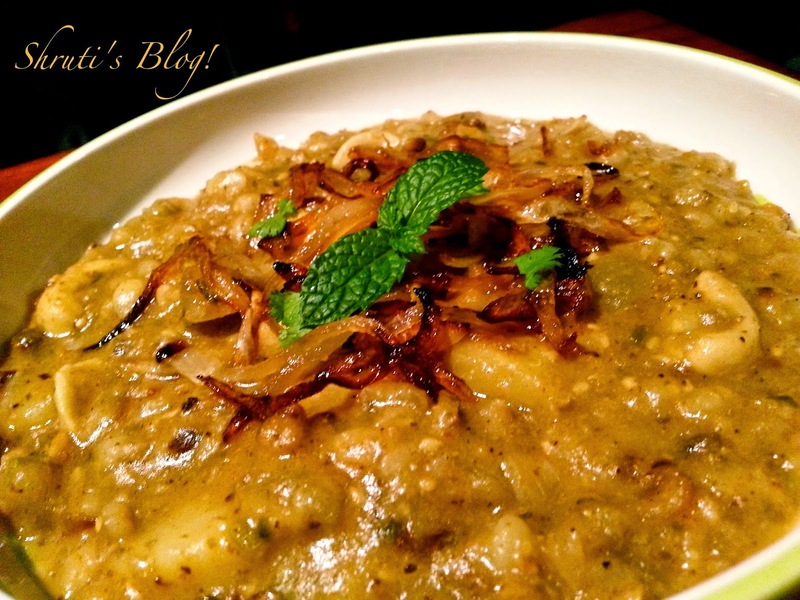 - my heart almost sank when you put a post about Haleem. I thought you had broken the shackles of vegetarianism and jumped ship. Nice post. How many servings would this recipe make .